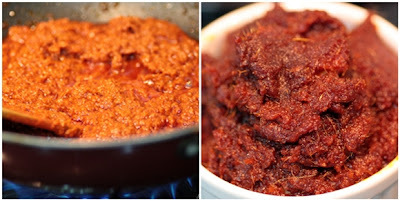 In a pot, heat oil and saute the blend paste over low-medium heat. The longer it's sauteed the better. I used to do it up to an hour, depends on the quantity. Saute until the paste becomes thick. This paste can be stored in an airtight container and kept chilled. When the grease released is visible, stir in the chopped onion, and cook for another minute. Add curry powder, stir well and add Spicy Lemongrass Paste, stir for another minute. Add water, salt, soy sauce/fish sauce and sugar. Bring it to boil and stir until the mixture thickens a little. 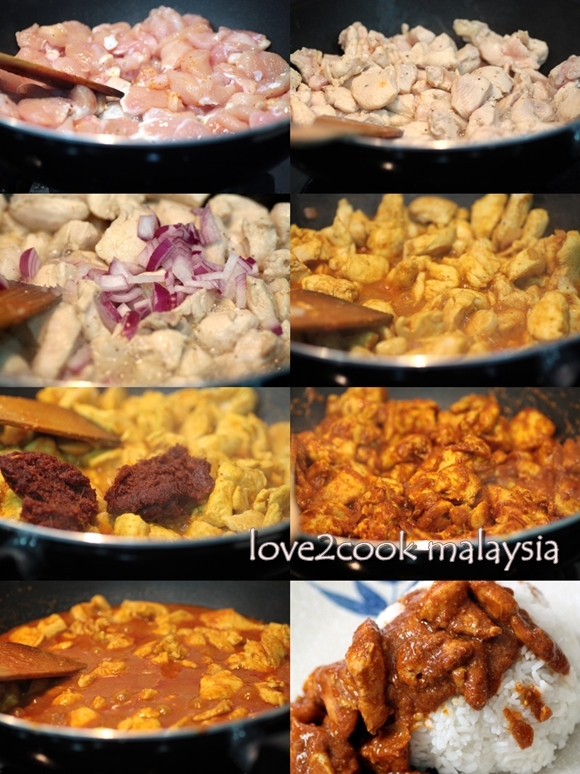 wow love,sooo rajin uat paste na.. already in the list for my hubby who a chicken lover too.. i like ur step by step pic.. can imagine the taste here!!! simple la paste tu kan.kalau buat untuk ikan bakar pun boleh guna jugak kot love. auuww dah tergoda nak merasanya kalau dah love kata 100% suit ur taste ek..
i absolutely love vietnamese food and lemongrass! looking at your chicken makes me drool...die die must try....hehe...thks for sharing dear! This looks awesom.. I loooooooooooove lemon grass flavor in anything.. looks fabulous. slurp slurp! yours look so yummy too! Already drooling over your Vietnamese Chicken, so colorful. Excellent preparation. I guess its the chilli in Malaysia, my mum's version is a lot more reddish in colour like yours too!! I'm a new follower through Kitchen Flavors..I look forward to looking through your recipes. Please stop by my blog for a visit! Yumm,mouthwatering here, wat a inviting lemograss chicken..
Looks so delicious.I'm drooling dear.Please pass me some..
First time to ur space. Love the collection especially the cake is so inviting to try out a piece. I love the masala paste very much. 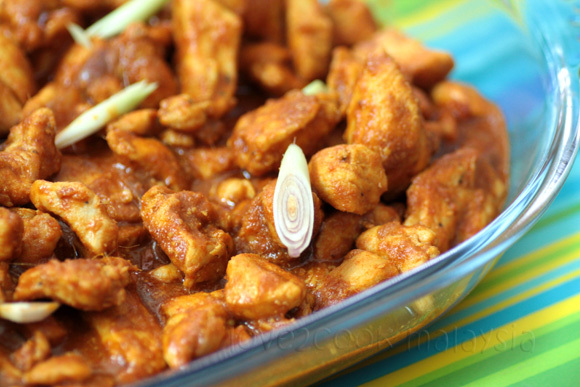 As I am a vegetarian suggest me an alternative for chicken to try out this recipe. Following you. Do visit mine when u find time. Hi Love..oooo sedapnya! !k.atie singgah mlm..dah habih ker? Hi dear! The chicken looks delicious. I am bookmarking the recipe for your gravy! will use it on some veggies. Looks delicious, i stopped eating chicken but i can surely make this for my husband! Spicy is the way to go! 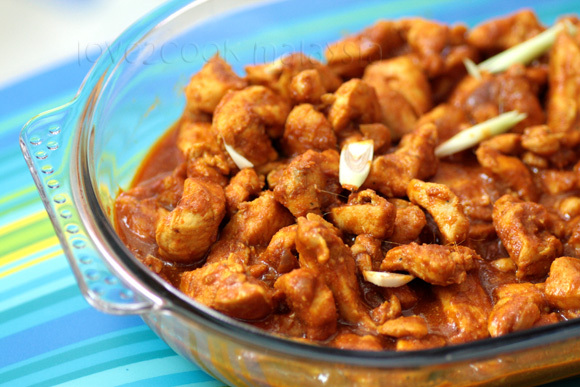 Love spicy food, and your chicken dish looks delicious with plain white rice! Yummy! Have a lovely weekend! oh wow!!! that looks so spicy and yummy!!! love to have some now..yummooo!! I like it spicy too :) This looks delicious and with 25 fried chilies, it must provide quite a kick! so superb dear my hubby love it..
That's a wonderful recipe. Looks so delicious. 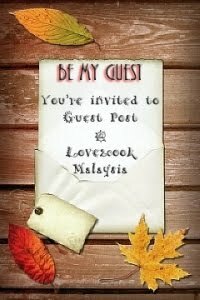 www.sharemyrecipe.blogspot.com is my blog drop by when u get time..